Everyone in our house loves fruit and there is nothing nicer than wandering out into the garden to pick you own. Fruits can be categorized into a number of different types including, orchard fruits, bush & cane fruits, and tender fruits. We grow apples, pears and plums. All our trees are still young but each year cropping appears to improve. Apples are great fruit trees and will often reward you with fruit the first year you plant them. Pears and plums are not so quick. 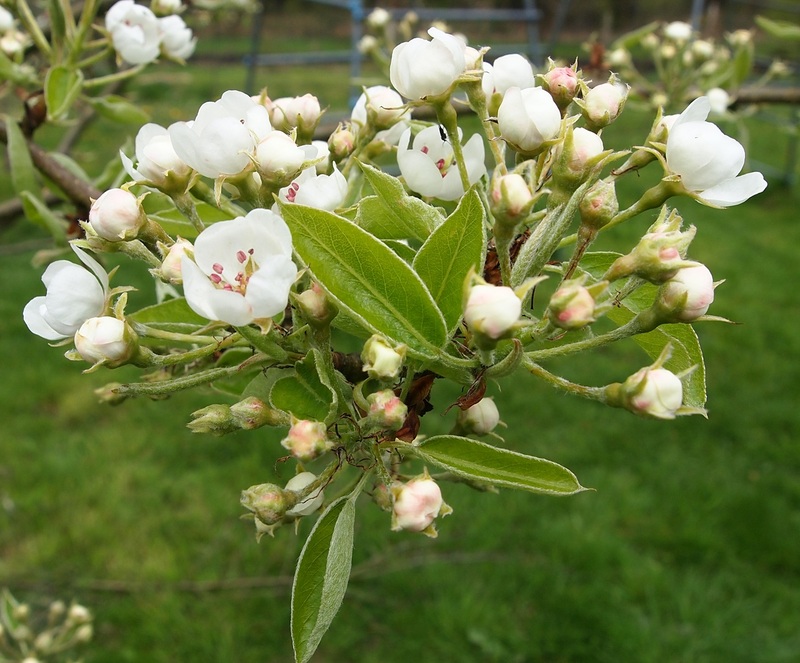 Our oldest pear tree began to flower only last year – six years after it was first planted! Only a couple of pears set and they subsequently fell off. This year there is a lot more fruit so we are more hopeful. The plum had five fruit two years ago, all of which the magpies stole on us, but this year there are a lot more fruit. Cropping is affected by a number of factors. Weather can have an adverse effect. 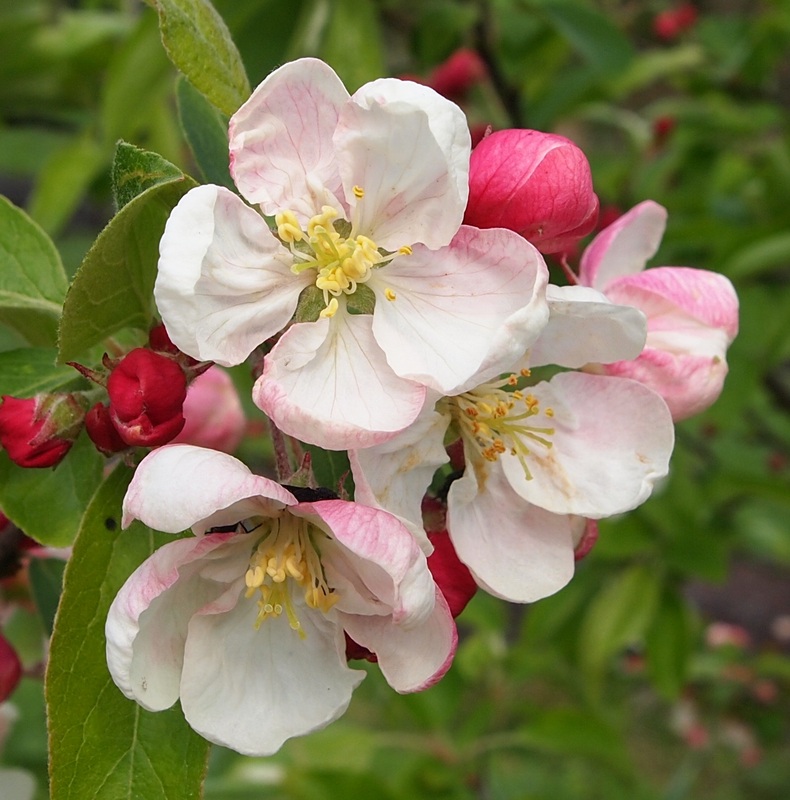 Frost or too much wind and/or rain at the wrong time can mean blossom is damaged and fruit doesn’t set. Pollinators need to be around in order to carry out pollination. Most orchard fruit trees benefit from being cross-pollinated by similar species, as this increases the yield. Apples can only cross pollinate apples and pears will only pollinate pears. If you only have one fruit tree make sure it is a self-fertile variety. One of my favourite apples in terms of flavour is Elstar. This is a relatively recent apple (introduced in 1972). It’s a variety that you can harvest quite late in the season (in fact, I harvested it as late as November) and is best eaten fresh though it will store for one to two months. It is thought to have relative poor disease resistance and we had to remove our one as it was badly effected with canker (a fungal disease of apple and some other trees). If you enjoy apple crumble as we do, then Bramley Seedling apples are an essential tree for your garden. This is a much older variety of apple (1837) and stores for up to three months. Bramleys are great croppers but can be susceptible to scab (another fungal disease causing dark’s cabby marks on fruit). We grow strawberries, blueberries, currants, raspberries and Rubus hybrids from the family Rosaceae including loganberries among others. Currants – are one of the earliest of our fruit to ripen. We have both red and black varieties. For some reason the red seem much more attractive to birds and if we don’t net our two bushes we would have no fruit at all. They don’t seem to be as interested in the blackcurrants from which we get a good crop each year. Strawberries – my sister gave me a present of two pots of alpine strawberries a few years ago. These are a much smaller strawberry than your common garden strawberry but are prolific. I keep a couple of pots in the polytunnel and harvest from late spring to late autumn. Unlike garden strawberries, Alpines don’t produce runners but they self-seed around the polytunnel and I move them to where I want them. We also have garden strawberries but cropping is weather dependent and we have only had one bumper in the last five years. Slugs like the fruit too and in some areas they will need netting to protect from birds, though for us it hasn’t been a problem. It is a good idea to move your strawberry bed after about three years. My apple tree is now coming up for six years old and produced 12 apples this year – the biggest crop so far. Hopefully, there won’t be strong winds just as the blossom comes out next year, though I guess it is better for a young tree to bear fewer fruit.